Cabin, 2 Bedrooms, 2 Baths, (Sleeps 4) plus queen size pullout in living area. Cabin Bascom - Walk to town! Walk through the 'Mahogany Doors' into your own world of natural beauty designed by Ross Markley, renowned sculptor and gardenscape designer in collaboration with art enthusiast, Kathy Hillman. Located doors away from the Bascom Arts Center, we invite you to experience this inspiring and rejuvenating retreat located at the head of the Greenway Trail and steps away from the Bascom. This thoughtfully renovated 2 bedroom/2 bath cabin features a designer kitchen fitted with granite, walnut, stainless steel and every attention to detail. The open floor plan to the great room encourages great times with family, friends or that special someone. A well appointed master suite is centered around an impressive double sided, tumbled marble fireplace... perfect for a cozy read in the five foot bay window, a relaxing jacuzzi bath, or a restful sleep on the king sized bed donned with Egyptian cotton/Bamboo sheets ... we say the most romantic suite in Highlands, despite the flat screen! The guest room wears red well with double bed, TV/DVD and is paired with its own bath containing a slate walk-in shower and art vanity. Hardwood floors and pickled spruce shiplap walls throughout, stacked stone fireplace and 42 inch flat panel TV in the living area. The vibe is light, open and airy yet the cabin is filled with eclectic furnishings and purposeful art. While surrounded by all that the interior offers, you are beckoned outside to a peaceful playground. Sip your morning beverage at the cafe table on the deck while watching the birds and ever unfolding garden. Sit on the reflecting bench and listen to the soothing waters of the eternal fountain. Enjoy a Highlands afternoon or evening on the lower deck around the granite firepit. If you can tear yourself from Cabin Bascom, you are conveniently located to all the world class amenities that the Highland area has to offer. Please inquire about other Highland's properties, The Roost & Foxdale Cottage at Mirror Lake. Highland's downtown is a 1/2 mile walk. 2 Flat Screens, WiFi compatible. Great Cabin close to everything. A great place for a get away or long stay. The kitchen is stocked with everything you need if you want to cook. A quick walk to downtown for shopping and dinning. Will definitely stay here again. We reserved this house for my daughter's 16th birthday. She likes the clothing stores up and down Main Street, and this year did not disappoint. We were within a half mile to the town of Highlands where we enjoyed a lot of shopping and great meals. Dinner at Paoletti's (reservation recommended), great homemade sandwiches and soup at Sweet Treat Deli, and breakfast most mornings at Mountain Fresh which was also the grocery store (and our go-to place for pizza). The house itself was so nice and provided everything we needed. We loved the easy use of the master fireplace, and used it often. The walking path behind the house was an easy stroll which led to more interest in hikes around the area. We picked up a hiking and waterfall guide from Kilwin's downtown (where we also stocked up on chocolates) and planned a full day for both these activities. We enjoyed our time here, and would love to come back to this lovely home in the future. Thank you! Very nice place. But numerous lights out throughout the house. No dishwasher soap. Everything else top notch. Close to the city, the museum and great for a location walking to either. Tucked away from Main Street but only a very short walk to the hustle and bustle of downtown, this cabin is the best of both worlds in beautiful Highlands. The property is located directly across from a trail head that connects to other trails in the area, or choose to head to Main Street for coffee, shopping, and restaurants. The cabin had plenty of room for two couples yet felt cozy enough to be a true home away from home. I highly recommend this property as it is everything you will want while visiting the North Carolina mountains! This is a perfect cabin for a Highlands getaway. It is clean, updated, well maintained, updated, and very comfortable. There is a trail directly across from the front door that will lead you right into Highlands- perfect for a morning walk into town for a coffee etc. Can't say enough nice things, would stay again in a heartbeat. We loved everything about our stay at Cabin Bascom! Beautiful cabin and perfect location! 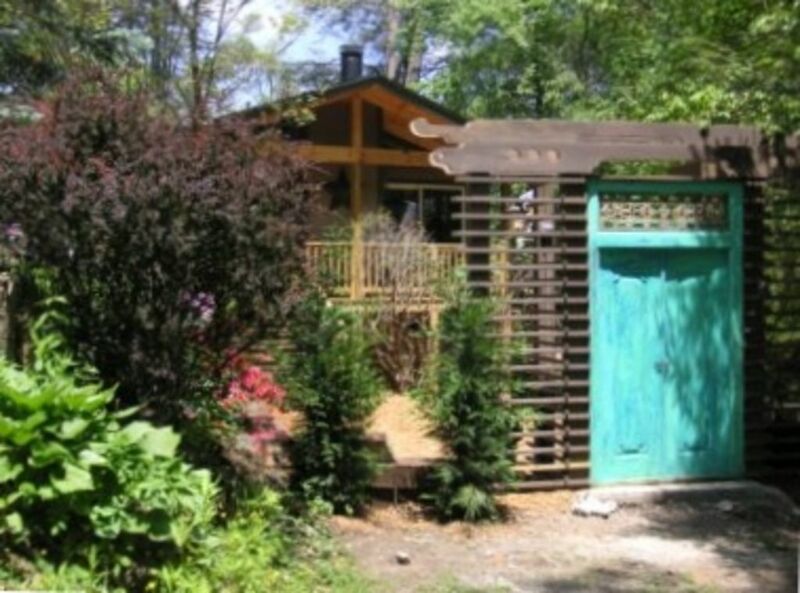 This 2 bedroom charming cabin is very comfortable for 4 people. The furnishings are absolutely beautiful, beds are fabulous, and wooded views are gorgeous. What a plus to find a trail and babbling brook just across the street! We loved hiking in the wilderness, as well as visiting the many nearby shops and restaurants on Main Street. The musical theater shows at the Highlands Playhouse Theater were incredible! We had a GREAT week at Cabin Bascom!! !